Conductr is a great looking, well- behaved and very usable controller for the Live user with an iPad. Live specific, so very little effort required with initial set-up. Highly customisable. Doesn't try to imitate Live's interface, or include every feature. Up against some stiff competition. Conductr is an iPad-only control app for Ableton Live. The free download provides control of up to four tracks and 11 scenes, with two customisable modules. After that, it's a matter of making in-app purchases at £5.99 each for unlimited clip, mixer, or custom module functionality, or forking out £15.49 for the full pack. You need to install the free Conductr Server on your computer, which manages the connection with the iPad app, as well as installing a controller script into Live; then set up a WiFi network, open Live, and choose Conductr as a control surface. Conductr is based on modules - sets of related controls, which are combined in the 'Playground', displaying between one and four modules at a time. You can load different modules and switch views on the fly without interrupting your jams. "You can assign parameters to recognise up to eight fingers touching the screen at once"
The Clips module automatically shows the Session View, with clip, track, and scene names and colours, and track stop buttons; active clips are highlighted in white. The Mixer module accesses track and master volumes, pan, sends, mute, solo, and record, and shows real-time levels and peak warnings for each track. The Master module covers functions such as transport, metronome, and tempo. These modules take control of Live automatically - no assignments necessary. Modules can be linked, so when you scroll left to right across the clip grid, for example, a mixer module on the screen will also update its view. 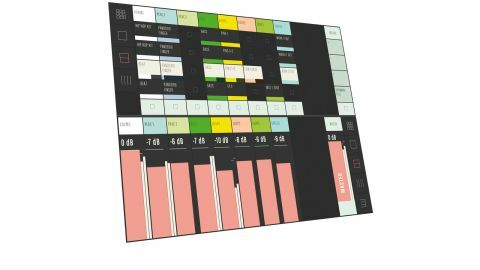 The user modules are freely-assignable, and each can include up to eight parameter assignments, from Live's devices or third-party plug-ins. You can select the desired parameters from a pop-up list, but it's faster with Conductr's Learn function: tap Learn, then move the control inside Live and the assignment is captured, whether it's from a Live native device or a third-party plug-in. The XY controls in the user modules are very cool - you can use these to control up to 16 parameters per pad, while using up to four pads at once. And there's another take on touch control within the default user module: you can enter an interesting gestural multitouch mode where you can further assign parameters to recognise up to eight fingers touching the screen at once. It recognises the number of fingers on screen rather than their position as a way of identifying which parameter you want to change. There is no 'ultimate' Live controller as we all have different needs, but Conductr certainly has simplicity and a winning interface on its side.